I DID IT!!!! 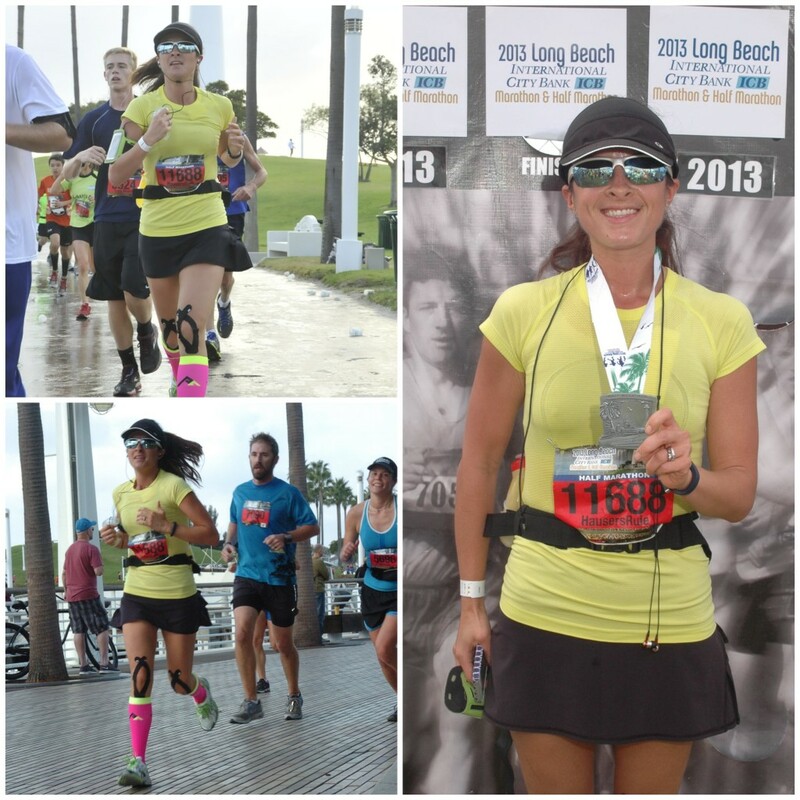 October 13th 2013 I completed my first half marathon! I look at this photo of myself today and I don’t even feel like it’s really me in it, or that I was the one who actually ran the race yesterday. It was such an adrenaline filled experience that it’s hard to put myself back into the feelings of the day. All I feel now is pain in my legs and a huge feeling of accomplishment, but I will do my best to recap the events of yesterday. My alarm clock was set for 4:25am with the intention of meeting my girlfriends Ryann, Wendy and Annie at 5:00am to make the drive up to Long Beach. Of course my nerves woke me up every hour through the night and I was up at 4:05am. There was no point in going back to bed so I got dressed into my perfectly laid out running clothes from the night before. Went downstairs and fueled up with some oatmeal and Spark! I paced around the house for awhile, went over everything I needed 100 times and out the door I went. The girls were all wide awake too and ready to go. The hour long drive went by quickly, but the car was getting quieter and quieter the closer we got…the nerves were kicking in full force! Not to mention the need for everyone to find a restroom STAT! We got out of the car and the first race of the day began…bathrooms and race packet pick up! We all met back up at the main area of the race and decided we wanted to line up as close to the front as we could, in the first wave of runners. We knew the course bottle-necked around miles 2-3 so we wanted to try our best to get out ahead. And there we stood with about 15 minutes to go until the 7:30am start time. I put in my ear buds, cranked up “Safe and Sound” by Capital Cities and just looked around with a smile on my face trying to fight back tears. Standing in a sea of 12,000 other runners is something you can’t even put into words unless you are standing there yourself. The air was cool, the sun was coming up behind the clouds and it’s rays were shining down on our ocean view. I wasn’t nervous at all anymore…I was ready to go. And off we went. Obviously we were slow out of the gate since there we so many people but it opened up almost immediately. 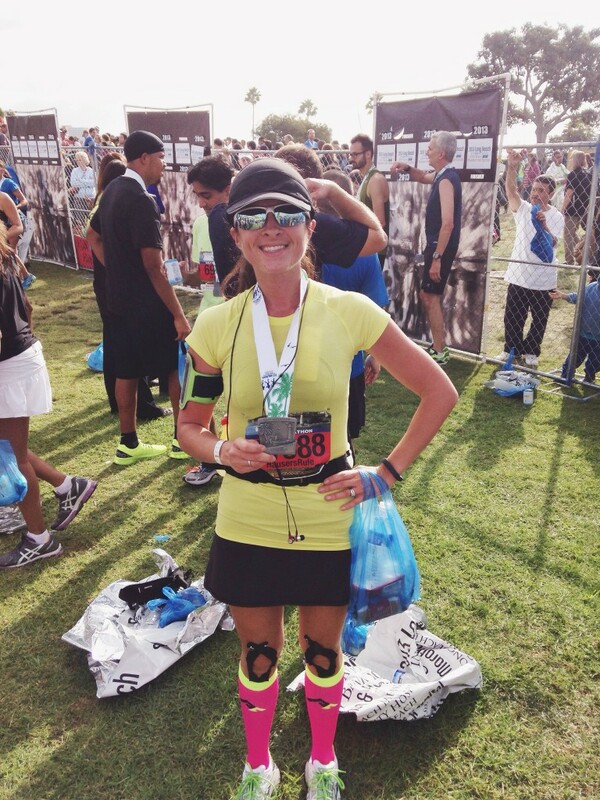 I felt very alone, even though I was surrounded by thousands of other runners. I didn’t want to get caught up with them…I just wanted to think about myself and how I was feeling and take it all in. I got into a good rhythm. I know my running playlist like the back of my hand, and I thought I knew my pace based on some of my songs. I was wrong…mile 1..split time…7:54. I was running the race like a 5k and was at a sub 8:00, not where I wanted to be because I knew it wasn’t sustainable. Slow down Lauren…sloooooow down. Miles 2, 3, 4, 5 ….still sub 8:00. I felt great, but I just couldn’t get myself to SLOW DOWN! I knew the adrenaline was taking over me as well as the inexperience of never running a 13 mile race before. I was trying my best to not get hung up on my time, but I was really worried I was going to hit a wall…hard, and be really upset that I ran so fast at the beginning of the race. My only goal I ever put on myself was to never walk, and to try to get under 2 hours as my final time. I begin to get fixated on the numbers to get there and had to get my mind off it. At the perfect moment we rounded a corner and the views that were ahead were incredible. The Queen Mary ship was to my right, fountains were spraying out of the ocean, spectators were standing on all sides of me. I couldn’t help but smile and look around….it’s as though everyone was feeling the way I was at that exact moment. People were unstrapping their phones from their arms just to take a photo, the energy surrounding me increased, and I could just tell that the beautiful scenery change was what we all needed. It was time to just enjoy the moment, breathe, and just run….run without any pressure of times, pace, who was passing who, how many miles were ahead…just run. That emotion took me through miles 6-9 as we ran on the boardwalk. Sand and spectators to my left, more sand and the endless ocean on my right. The sun was still hiding behind the clouds, and there was a cool ocean breeze. I couldn’t have asked for better running conditions. And then it hit….I was getting chilled, I became fixated on how much further I had to go, my legs started to hurt and not move as fast as I wanted them to, my times were slipping…8:00, 8:10, 8:30, 8:40, 8:59…it was happening….I was breaking down mile by mile. I would say that miles 9-11 were incredibly hard for me. Everyone started to pass me. I tried to put on all my fastest songs but my legs wouldn’t move to them. I wanted to walk. I really, really wanted to walk. I tried to think about the glory of finishing, but it still seemed too far away. I saw the 11 mile marker where the marathon runners go right and the half marathon runners stay left. Are you telling me other people could actually go on to run ANOTHER 15 miles right now?! You have got to be kidding me…I am obviously not cut out for this. I was fed up. Spectators were standing on both sides of the street, holding out boxes of donut holes for the runners. Donut holes?!?! I was insulted and wanted to throw them at their faces. I closed my eyes at this point because I needed to snap out of it. 2 more miles. 2 more miles. Who cares about donut holes you have 2 MORE MILES! My mentality changed. 2 miles is nothing! I run 2 miles for fun…for warm ups. I was replaying a 2 mile loop I do in our neighborhood over and over in my head. Convincing myself that I had just started it and that’s all I had to run for the day (forget the 11 miles I just tackled). And it was on! I pushed myself to finish strong. I felt like others were sprinting at this point, and people were flying by me out of the blue. I guess this is where the heat gets turned up so I went with it. Although I wasn’t going as nearly as fast as I was at the beginning, I was going as fast as I possibly could for the condition I was in. 1 MILE LEFT! 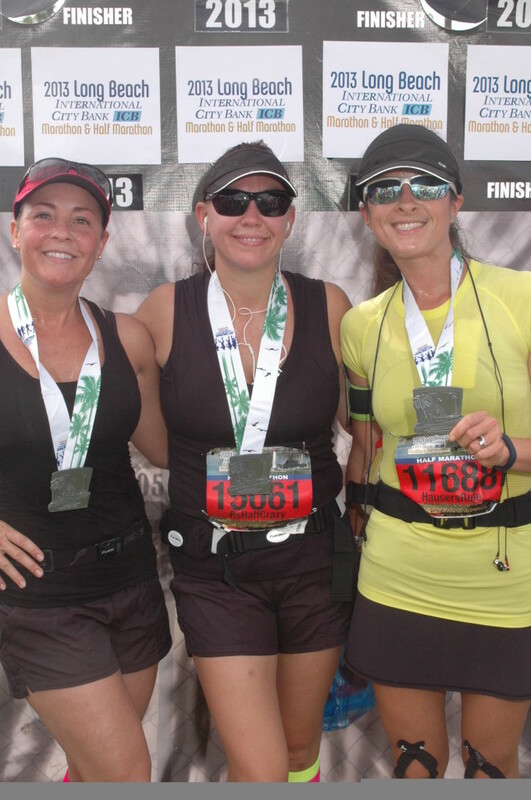 I pictured the finish line…I pictured being DONE…I pictured seeing all my friends…I pictured a huge bottle of water. None of these things were coming fast enough. I still wanted to walk, but I was so close I was not giving up now. 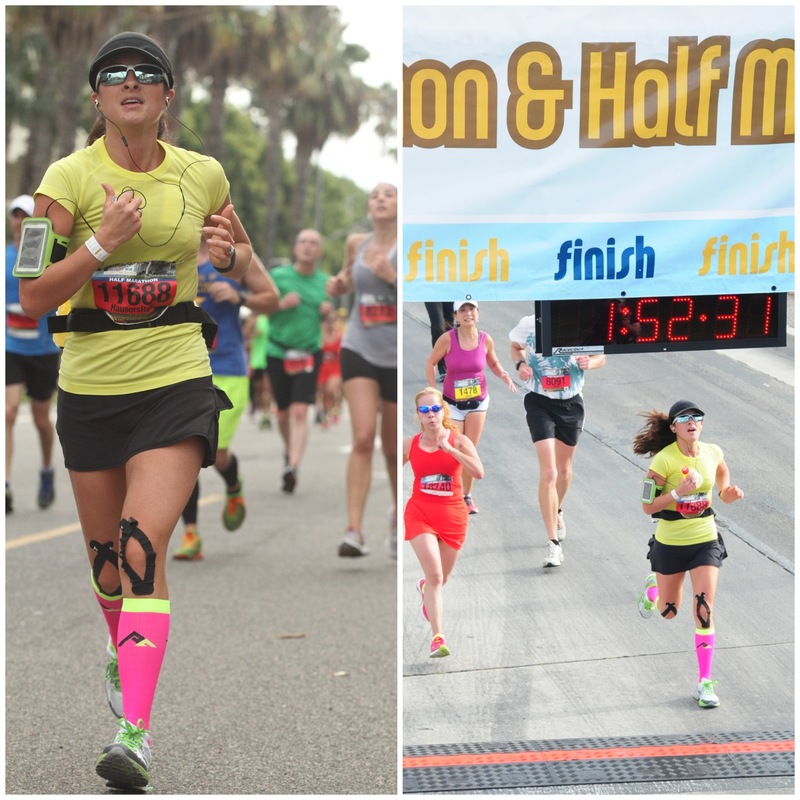 I couldn’t see the finish line anywhere but my body was telling me I was fast approaching mile 13. I tuned to the left and there it was. THE END! I don’t even remember those last few steps in. I think someone took my photo, I think someone gave me a medal, I know there was water involved, I think I actually yelled out…”OMG I’m done!”. It was all a blur…and I continued to walk around in a haze for a couple of minutes. I wanted to cry…I did it!! I stood by myself for awhile right at the end of the finish line. I didn’t know if my friends were behind me or ahead of me but I wanted to stand there regardless and relish in that quiet moment while others were celebrating all around me. I knew I did well…I knew I beat my goal time of 2 hours…and I knew I felt proud beyond belief. I asked a stranger next to me to take this photo…thank you stranger, you don’t know how much this photo means to me. I have trained with Ryann and Wendy for the past 2 months…we lost each other at the start line but I knew they were coming in any minute now. And there they were, I have never been so excited to see their sweaty and smiling faces. I could tell they were still in the after race haze so I gave them some space but soon after we were celebrating with our other running friends, snapping photos and of course marching our sore butts right over to the beer garden for our free beer! I have never had a beer that tasted so good in my entire life. 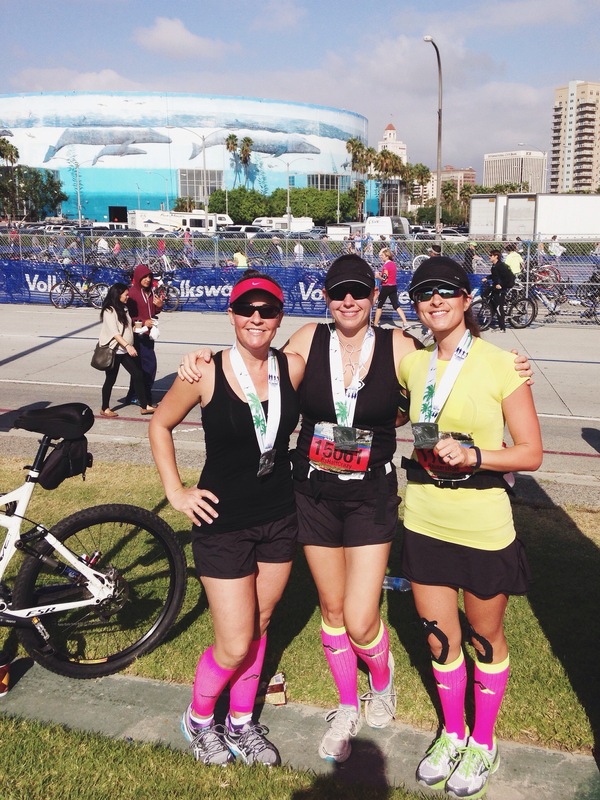 As we sat in the grass, talking about the race, I hid tears behind my sunglasses several times. I was just so overwhelmed by how great I felt and how proud I was of myself and my friends. As we enjoyed our ice cold beer and 80’s tunes from the nearby band, Ryann yelled out…my results just got e-mailed to me. We all checked our phones…Personal Records for those that have raced before and Ryann and I hit our goals dead on for our first race! 1 hour and 51 minutes. 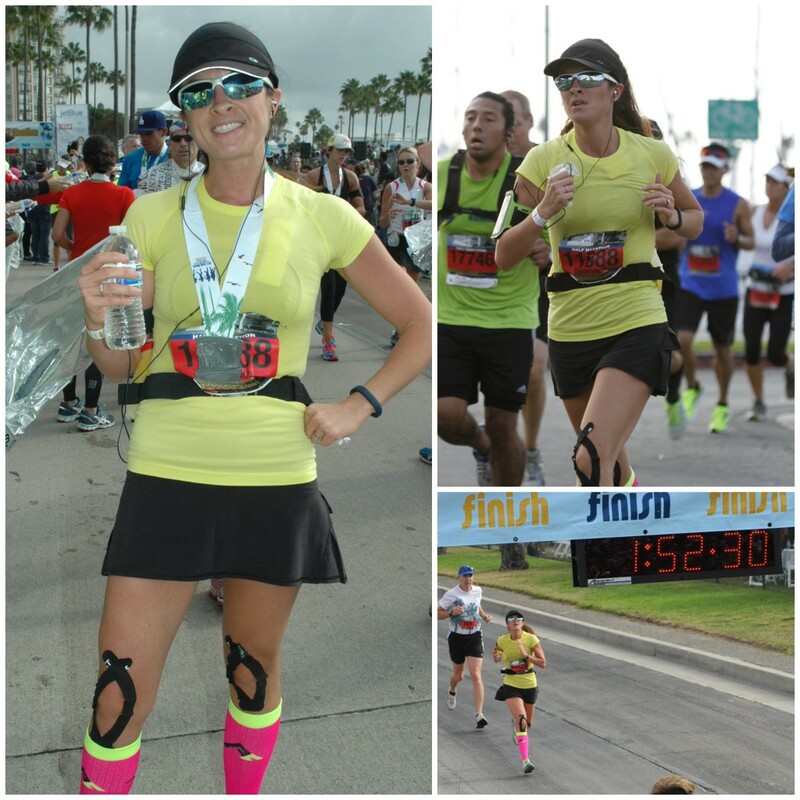 I was so excited to get under 2 hours and maintain an 8:33 pace overall. Here are my stats out of the 12,000 runners. To finish in the top 5% of women is honestly mind boggling to me. I finished DEAD last every single time we did the timed mile run in middle school and high school. They would cap me off at a 14 minute mile. I’ve truly never gotten over the embarrassment from those days of feeling shamed for being the slowest runner. I feel so redeemed knowing how far I have come. 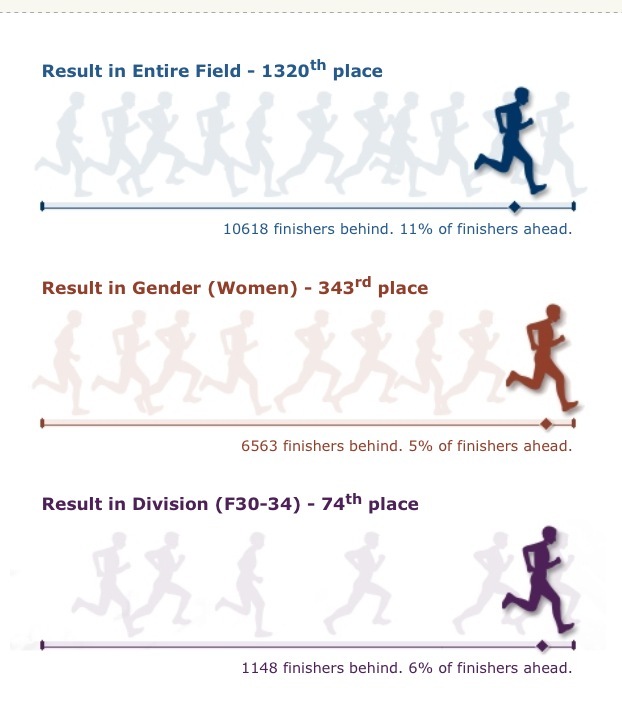 My favorite part was on the side notes of my stats it said “FYI-you beat 81% of all MALE runners in the race”. BOOM! Take that high school phys ed teachers who gave me my only C on my report card! 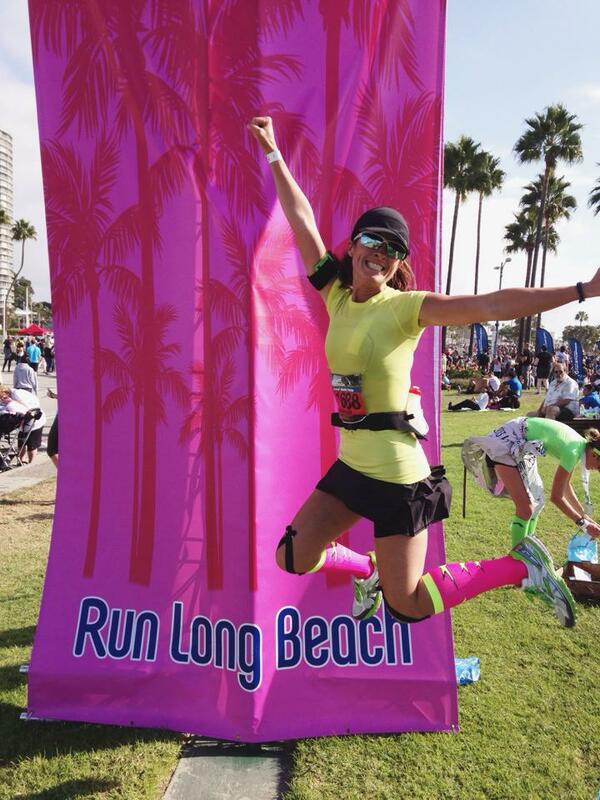 While I was running I thought I would never do another half again, but now I can’t wait to go for my beach cities medal and complete the Huntington Beach half in February and the OC half in May. Maybe just maybe I will be one of those people who head to the right and go the extra distance for that marathon one day…but for now I will embrace that my legs are sore, my heart is full and my first half marathon is under my belt! 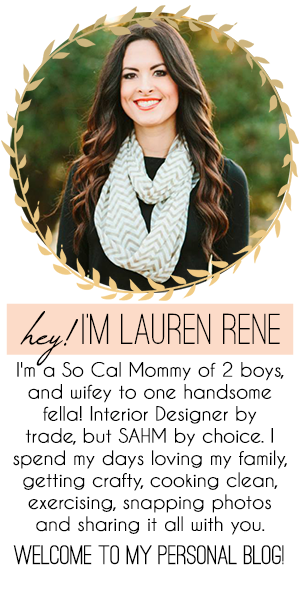 Aw, thanks for the shout out, Lauren! Way to go!!! This is so great. I think I almost shed a year for you – what an accomplishment!!! Thank you Kara!!! I hope you are doing well…I need to catch up on IG…I am way behind and need to see some cute baby photos! Lauren, you are such an inspiration! You ROCK girl and you can be proud of what you’ve done. I think it’s really amazing!!! Thank you so much for your kind words Iris. It means so much and definitely gives me the confidence to keep going! I appreciate it! I just cried reading this!! 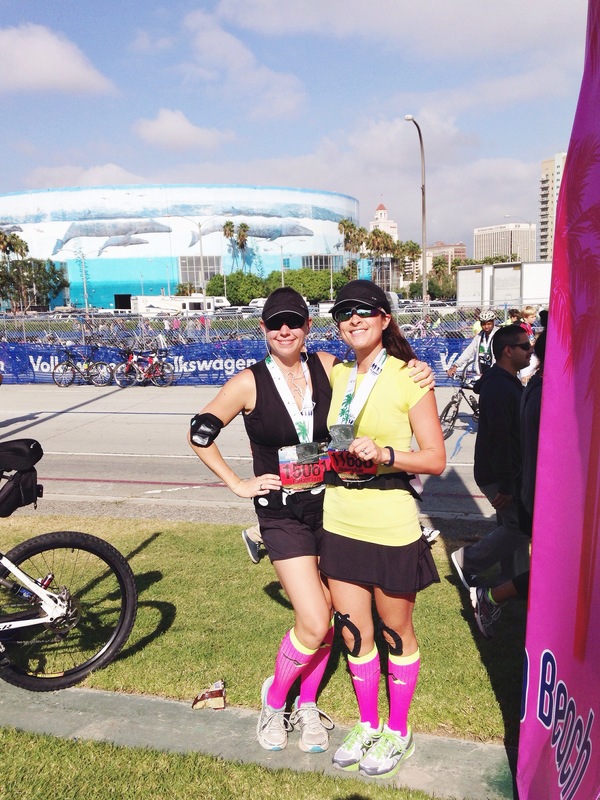 I am so proud of you – this is so inspiring!! Awwww thank you Alena! I’m so proud of how far you have come too…you are looking GREAT mama!!! Well done Lauren! Very proud of you. We’ll have to go for a run together next Memorial Day weekend xo. You bet!!! 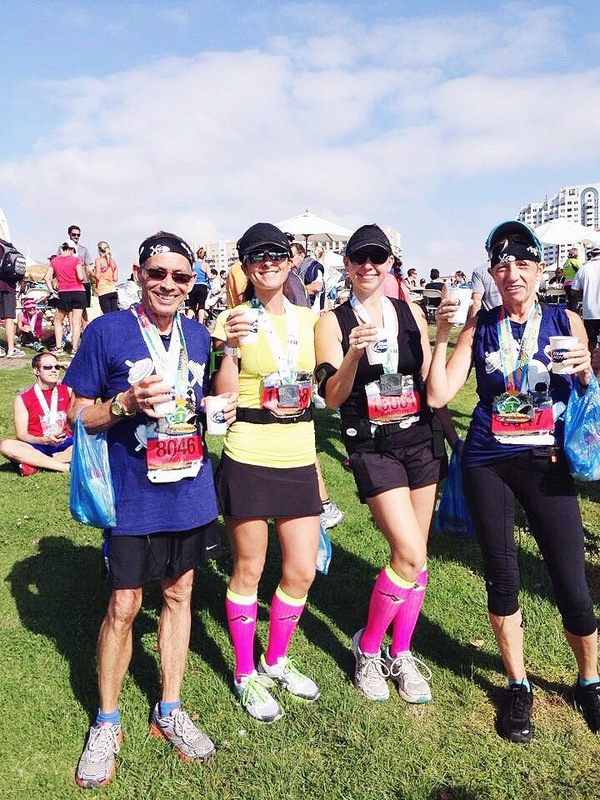 Thank you Stash….I really admire all your awesome running accomplishments even more now! Loved reading this story, Lauren. I am SO proud of you!!! Thanks so much Lindsay I appreciate it!! You did amazing – excellent excellent time- so proud of you Lauren – and Ryann too – we have found ourselves some awesome running buddies who will keep us on our toes. I am still on my own high!!!!! Thank you as always Glen!! I know what you mean by the runner’s high! I’m already counting down for Surf City! Have to get that big medal like you two! So proud of you!!!! I love the action shots! !